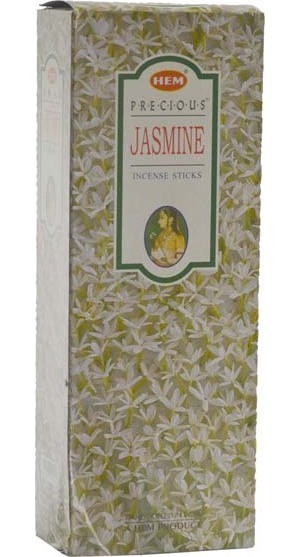 The delicate scent of Indian Jasmine blossoms will fill the air with the scent of tiny white flowers fit to be lain at the feet of a Goddess. The gentle fragrance is evocative of a million small white blooms that civer the Indian countryside, a scent that is infinitely desirable and relaxing. Made by Hem, one of India's leading incense makers. 10" long incense sticks, 20 gram box apox. 20 sticks. Hand rolled in India.